A screenprint is produced using a gauzy screen that has been stretched across a rectangular wooden frame. Ink is spread across the top portion of the screen by the printer, who then pulls the ink towards them with a rubber blade commonly known as a squeegee. The pressure forces the ink through the screen and onto the paper below. Parts of the screen are blocked with a stencil; ink passes through the open mesh to create the print. A different screen is used for each color. The design of the poster can be “applied” to the screen in a variety of ways, such as affixing a paper stencil directly to the screen or applying hardening glue. The most common, however, is the use of a special gelatin, enabling the screen to reproduce photographic imagery. The printed surface of a screenprint differs dramatically from that of a lithograph. Lithography is a planographic technique, meaning the printed surface is flat. In screenprinting, ink is deposited in a thick layer that builds up on the paper’s surface. Screenprinting produces a rich impasto of ink that lends the poster a velvety presence, a quality that attracts it to many designers. Because it does not require an expensive press or a large amount of equipment, screenprinting has remained popular as a hands-on medium, more approachable to most designers than lithography or offset lithography. Andy Warhol was introduced to screenprinting in the 1950s when he was working as a commercial artist, and it became the medium through which he produced his most celebrated canvases and works on paper. Until Warhol, screenprinting remained largely the purview of commercial printing, with the mark of the designer’s hand distinctly absent. An enthusiastic and experimental printmaker, Warhol created screenprints with constantly changing variables including mutable colors and shifts in registration. 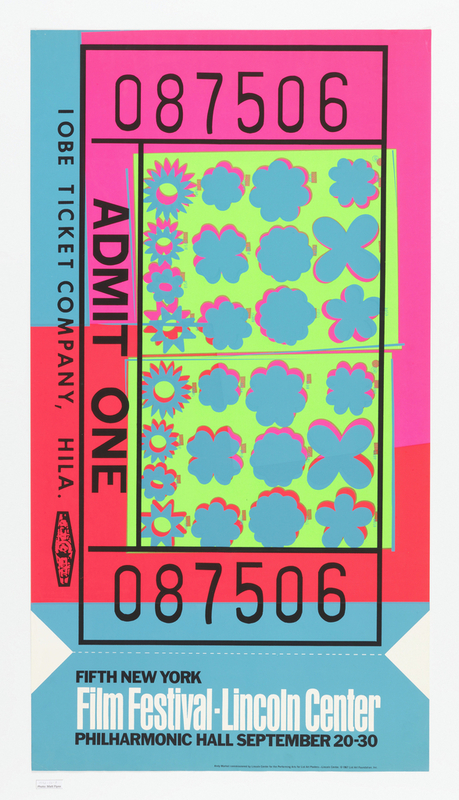 For his poster Admit One from 1967, Warhol mimicked the appearance of a movie ticket, printed on a massive scale over off-kilter layers of neon flowers. While perfectly registered, the poster carries the impression of a quickly assembled design. Though Warhol famously said he wanted “to be a machine,” he transformed the aesthetic of screenprinting into a medium that revealed and reveled in its own making. Poster, Oil and Water Do Not Mix, 2010. Designed by Anthony Burrill with Cecilia Azcarate Isturiz and Tom Galle for Happiness Brussels (Brussels, Belgium). Screenprint with oil culled from the Gulf of Mexico, sand, and extender base. Printed by Purple Monkey Design (New Orleans, Louisiana, USA). 76.2 × 50.8 cm (30 × 20 in.). Gift of Anthony Burrill, 2012-13-1. Caitlin Condell is the Assistant Curator in the Department of Drawings, Prints & Graphic Design at Cooper Hewitt, Smithsonian Design Museum. Poster, Admit One; 1967; Andy Warhol (American, 1928–1987); Screenprint on paper; Gift of Donald Karshan, 1972-58-7.